The creation of paths is a collective act shared with those we have never met and often could not, previous contributions having been made in a different epoch. Now we may walk along a path for pleasure, but most were formed for trade, droving, war or even smuggling. Unlike the car or bike, our feet are in direct contact with the earth, with speed being secondary to experience; to tread paths is to feel the past. The environment has altered, but research and imagination can help us extrapolate what previous travellers saw and felt. In the past so much time was spent walking that observing nature was unavoidable, though in this wood many did so as an escape from reality. Remove the entire natural landscape from around a track over four years, then put it back again. Not a forest fire . . . artillery fire. 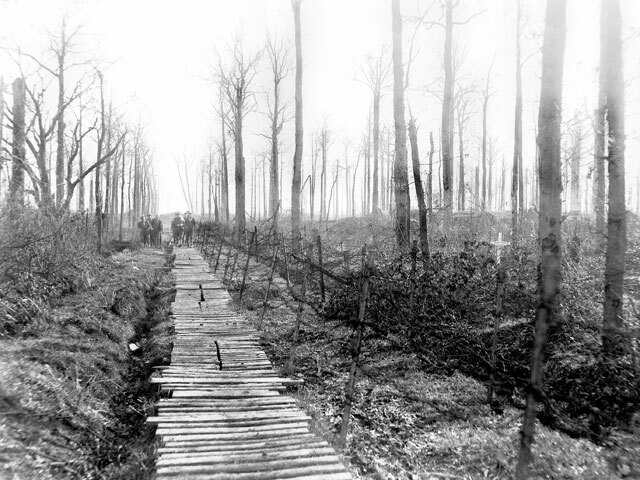 Ploegsteert Wood on the Ypres salient once sheltered one million men. 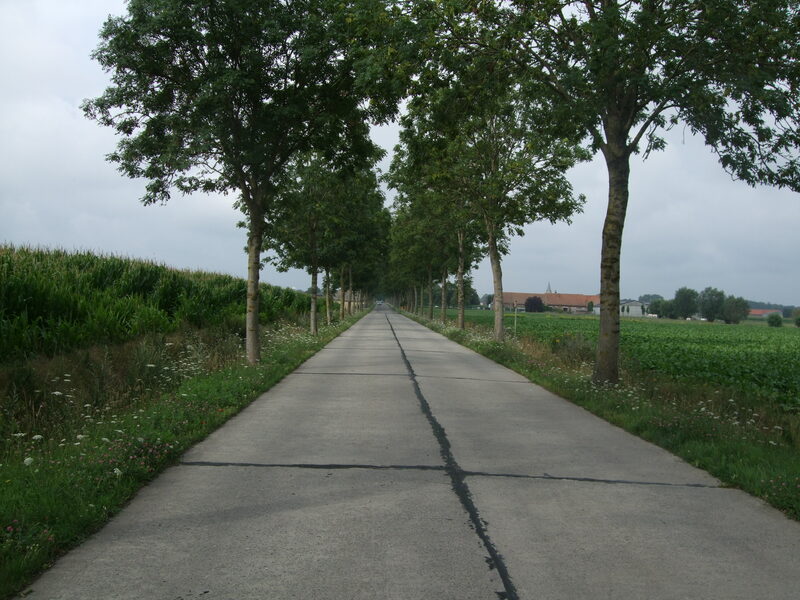 “Tommies” corrupted “unpronounceable” Belgian names, thus Ypres became Wipers, and so Plug Street Wood. I walk the track that would have been familiar to serving soldiers and future prime ministers, Winston Churchill and Anthony Eden. Henry Williamson, mystical nature writer and author of Tarka the Otter, participated in the Christmas Eve Truce on the edge of the wood in 1914. The nineteen year old’s friendly encounter with young German soldiers in no man’s land confirmed his view that the war was driven by greed, bigotry and false patriotism. Williamson’s experiences ignited a belief that he was at one with Nature. Existence was a link in an eternal chain that reached back into ancient history. In 1919, influenced by the writing of the19th Century English nature writer Richard Jeffries, he became convinced of the existence of a union between the eternal sunlight and the earth’s past. He likened the ground to stirred Christmas cake mixture which, with rain, turned to porridge; the wood could not recover in less than fifty years. However in 1928 he returned to the Salient. Dug outs had subsided; rifle barrels, machinery, holed helmets and minenwerfer cases had rusted. He delighted in observing plants, frogs and recognised a dozen different types of bird song. Anti-war, anti-industry, to Williamson truth and peace lay in beauty and the open air. Surprisingly he made a catastrophic misjudgement in embracing Fascism, admiring the Fuhrer, extolling the Hitler Youth, visiting Munich and becoming a Blackshirt. In 1940 he was briefly arrested for suspected spying. Post war he refused to believe that the holocaust had happened. Over eighteen years he wrote fifteen volumes of “A Chronicle of Ancient Sunlight”, the early books dominated by his experiences in the trenches. A century later, I look up at a diverse canopy of twisted oaks, round crowned hornbeams, elders with fissured bark, chestnuts, pollard willows, elms and hazel. 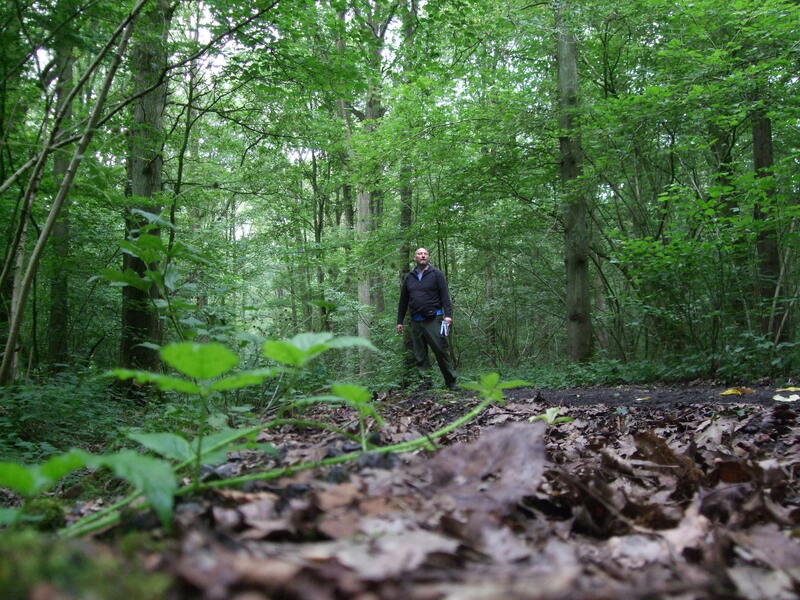 Beneath the leaf litter lie men and vast quantities of artillery shells. The wood’s beauty belies a formidable army of biomass that is far more powerful than the products of men’s folly. Their weapon: seamless integration of decomposing fungi and bacteria, plants and animals and time. In the long term they are unstoppable. Together with their allies’ oxygen and water they will reduce ordinance into minerals, pull down bunkers, rot leather and military webbing, fill shell holes and remove the dead. Plant root hairs absorb and assimilate. No propaganda, no rhetoric, just unrelenting action. True their action is slow, but if life on earth is represented by an hour on the clock, then our existence consists of two seconds. We tend to adopt a humancentric appreciation of time. He died the day before he was due home on leave on the 27th August 1915. Vera, who also lost her brother, served as a VAD nurse and then returned to Oxford, where she became a feminist and pacifist, writing the influential anti-war book “Testament of Youth”. She married in 1925. Her daughter Shirley Williams became Labour Minister for Education and a founder of the Social Democratic Party (SDP). 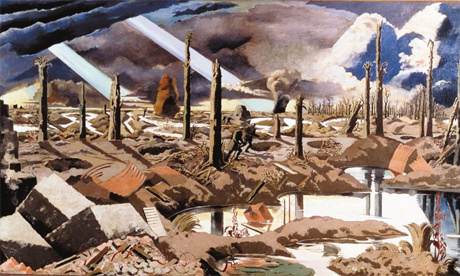 By 1918 the artillery had reduced parts of the wood to scenes such as those painted by Paul Nash in his depiction of the nearby “Menin Road”. Roland Leighton wrote his poem in the spring 1915 but my July walk was devoid of flowering violets. Instead rose-pink Red Campion watched the Lords and Ladies dance with orange berries in their gradual progression to toxic signal red. But my eyes were fixed on one of nature’s sirens, one that cast me back to childhood and a mother’s warning: Witches Gloves, Fairy’s Glove, Gloves of Our Lady, Bloody Finger, Virgin’s Glove, Fairy Thimbles. Today we know it as the foxglove. Glove, obvious, but fox? Richard Mabey dismisses the idea that it is a corruption of folksglove, a name recorded in England in the 12th Century, referring to folk or fairies which inhabit the woods, though I don’t find convincing his suggestion that it is because they are found in “foxy” places. True, I didn’t spot any fairies … perhaps the wrong time of year. I sat against a slanted horse chestnut, the bark coated in an emulsion of translucent pleurococcus chased by ivy. The sinister deep green leaves concentrated with chlorophyll compensate for shady living. Above the algae, glade light reveals the bark’s reptilian blue scales, gulches flecked with cinnamon. Between mature trees saplings jostle and fight their way to the sun like stretching nestlings. The drone announces the twelve thousand beats per minute motor. Did Roland watch this bumble’s ancestor? It enters one of the lowest of the foxgloves bells. But this is not Wildean aesthetics. This is business, the commerce of nature; the oldest air transport firm has arrived for the latest transaction in a one hundred million year trade agreement. Air freights of pollen receive instant payment. 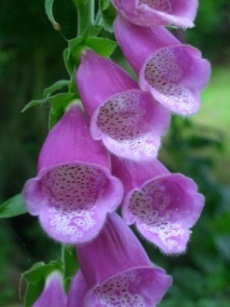 A single spike lifts the foxglove cluster skywards, tapered purple bells open with curled lips. Inside the tangerine anthers await. Smudged white ovals with purple spots strew the corollas floor. Why should such natural architecture have such imperfections – blurred spots in such a random pattern? Perception is the key. I see the “imperfections” because in the eye of this beholder, light is received by three types of receptors or cones. Sensitive to red, green or blue. Combinations of which are stimulated -result- I see purple foxgloves. Bees also have three types but substitute ultraviolet for red. Our purple is their blue. When we see white, our apine counterpart perceives blue green. So important is UV light that if artificially deprived of it the bees refuse to forage. Patterns of ultraviolet light emanating from the corolla are processed by the on board computer and act as a ground control for the incoming pollinator to negotiate the landing strip to reach its payload and reward. In flight wings build up static electricity on the hairs of their gaudy hymenopteran jumpers which act like magnets causing pollen to leap aboard. Marking each tube visited with scent ensures co-workers do not visit them. Grazers beware . . . all parts are toxic. In 1785 William Withering employed digitalis to treat congestive heart failure. It has a dangerous reputation amongst doctors, the margin of error between medicinal and lethal being narrow. I realised I had not encountered another being in the wood. Ancient sunlight, fairies, witches gloves . . . the real magic of the wood lies in nature’s power of regeneration. From the farm track I looked back at mixed ranks of beech, oak and sycamore sentinels – they had regained their domain. poignant First World War sites in Flanders. Fifteen minutes later they depart to continue their whistle-stop tour of the Salient. My thoughts return to a July morning two years earlier on the other side of the Franco-Belgian border. 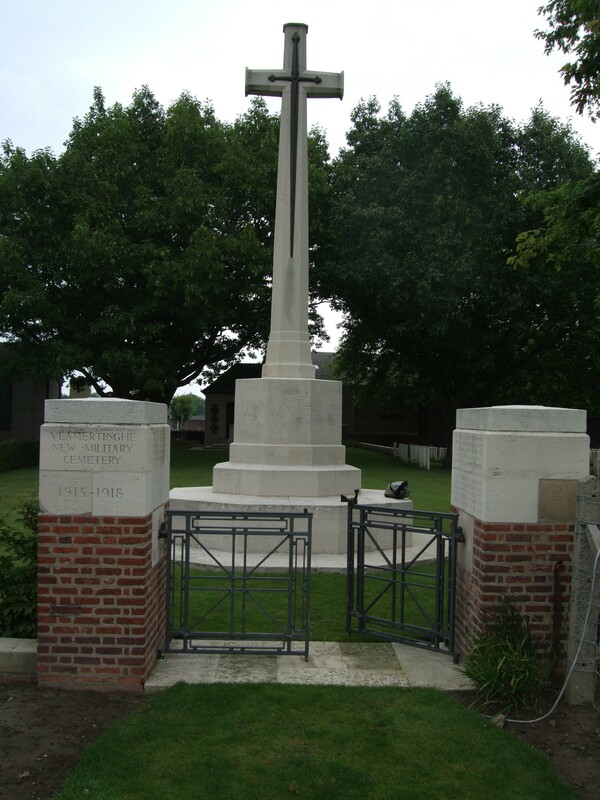 I’ve lost count of the number of world war sites, including cemeteries that I have visited on my walks– but this one was different. hedge and a screen of trees. Inside the perimeter other trees are spaced out, but it is not an orchard; it conceals a German military cemetery – but seems more like a fortification discouraging entry. This is a far cry from the light-reflecting citadels of the British fallen –their rows of Portland white stone gleam and sparkle and can be seen for miles in the distance. Climbing the steps that bisect the steep bank and hedge, I enter a different world. Passing through the wrought-iron gate, I see the plain metal box set into the stone wall containing the cemetery register. locations north of the Somme River. Nine years later, the German War Graves Commission started landscaping the cemetery. Work was stopped in 1939 at the outbreak of the Second World War. Not until 1966 were the Germans allowed to return to France to finish the building and landscaping. 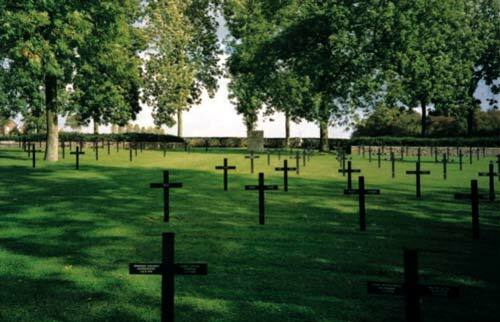 Unlike in other countries, maintenance of the German war graves is undertaken by a charity, with much of the work done by German youth volunteer groups. At the top of the steps, a sea of black metal Germanic crosses appears beneath the trees. Among the black crosses are fourteen individual stones and curiosity draws me to one of these. As I approach, I realize it is a Jewish grave and I stand staring at the little pile of small stones sitting on top of the headstone. I have seen this before and know that it is evidence of earlier visitors paying their respects to a Jewish soldier. Even if you do not know the deceased, it is the custom is to place a small stone on the grave using your left hand. I place a small stone on the miniature cairn. Ludwig Wehrmann had given up his life for the fatherland, oblivious to the ordeal his relatives would face some twenty years later at the hands of his fellow countrymen. However, here all men are equal. 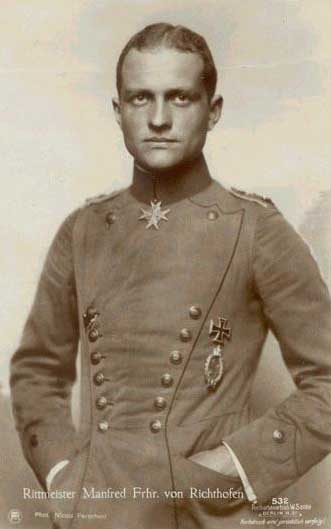 The Red Baron had been repatriated years ago and, the War’s most famous combat pilot, Baron Manfred von Richthofen, had been shot down five months before the end of the war. In 1925 his body was exhumed and reburied in Berlin. But, in this site, space isat a premium and his grave in Fricourt is now occupied by a soldier, Private Sebastian Paustian. Those that have their own grave must share a cross among four. Two names on either side. Many do not have their own grave. At the rear of the cemetery, four communal graves are marked by five stones – five rough hewn squat crosses. The light strikes the red stones revealing rashes of small lichen patches. Five thousand names packed onto metal plates. The remains of 11,970 soldiers lie in the four communal graves. Of these, the names of 6,477 remain unknown. atmosphere more sinister. These trees are brooding and sombre. Green foliage casting shadows over the horror. In some areas the flickering shadows pockmark the ground, giving a mottled appearance which shimmers. In other areas, shadows of individual branches point at the carnage below – moving on to new groups of graves as the sun orchestrates the grim light show. Below lie the fallen fruits, the bitter harvest collected from the Somme battlefields, the hedges constraining the ground to prevent it from bursting its gory seams. My head swirls with numbers that I can’t visualise or comprehend. on my travels- I fall asleep. A short time later I wake up and, opening my eyes skyward, remember where I am. This creates a chain of emotions First, horror – have I caused offence? I look around – then relief that I am still alone. It then occurs to me that I am the only one who could wake up amongst the 17,000 men. If the trumpet – or would it be a bugle – ever blew on the Resurrection Day, what would this small area look like – an army of field grey soldiers? I step back into my pleasant country lane, leaving the grey army to their sleep. Stones, crosses, mass graves, no matter, all the victors and defeated are now equal. 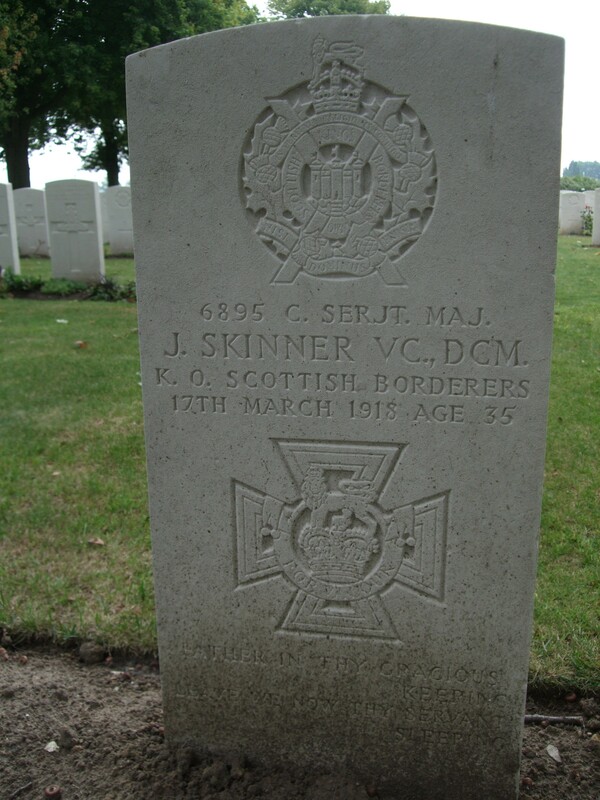 Arguably the most famous soldier in the 29th Division was a Glaswegian, John Skinner. He seems to have been a bloody minded hard man straight out of a war film. Joining the army in 1900 at the age of 16 he had been wounded three times in the Boer War. The objective was the intensely fortified village of Langemarck and the German defences concentrated along the Langemarck-Weidendreft road. The infantry were slowly learning how to overcome the pillbox threat but it remained dangerous and costly to overcome them. 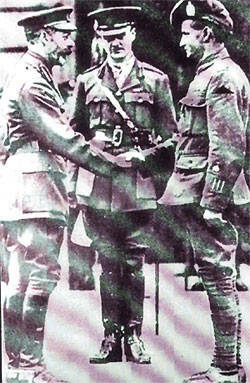 Skinner was awarded the Victoria Cross. After the investiture by King George he was given the customary 14 days leave. On returning to Folkestone, he engaged in a massive drinking binge,even though he still had a head wound from the action. He was ordered to go to hospital and then travel to a reserve battalion in Edinburgh. 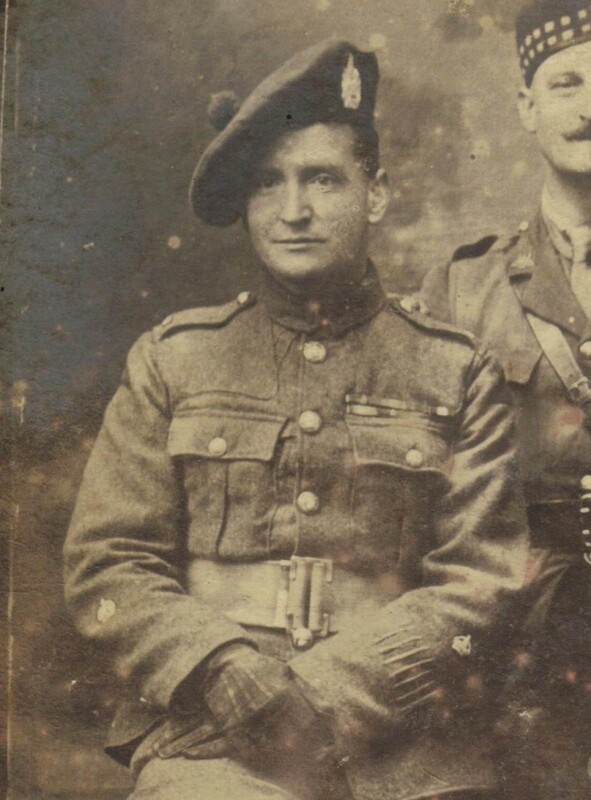 Perhaps the Glaswegian in him didn’t fancy Edinburgh: After two days in hospital he disobeyed orders and risking court-martial, he returned to his unit, the 1st battalion of the Kings Own Scottish Borderers in the Ypres Salient. 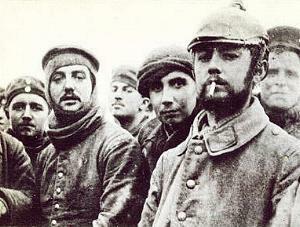 Skinner escaped disciplinary action because he was a legend amongst the troops of the 29thDivision. After being wounded eight times he placed a bet with his friend CSM Ross that he would get his ninth wound before Ross, who also had also been wounded eight times.On March 1918 Skinner won his bet attempting to rescue a wounded man in no man’s land, but could not collect his winnings as his ninth wound was a bullet between the eyes.The funeral was delayed so as to assemble 6 other VC holders from the 29th Division. I reached the village of Vlamertinghe and asked various locals where the military cemetery was. Amazingly, they did not know. Perhaps they were commuters. This was eating up time and it was unbelievable that I could not locate it in such a small village. Eventually I stopped an old man and although he could not speak English he and I communicated in sign language. I was quite chuffed with my impression of a crossroads, which was worthy of Marcel Marceau. When I reached the signpost it was pointing towards someones back garden. Was the mischievous John Skinner playing tricks on me? Was the sign correct? I gingerly walked through a private garden, passing the kid’s toys and the vegetable patch and there it was- The “New Military Cemetery”. 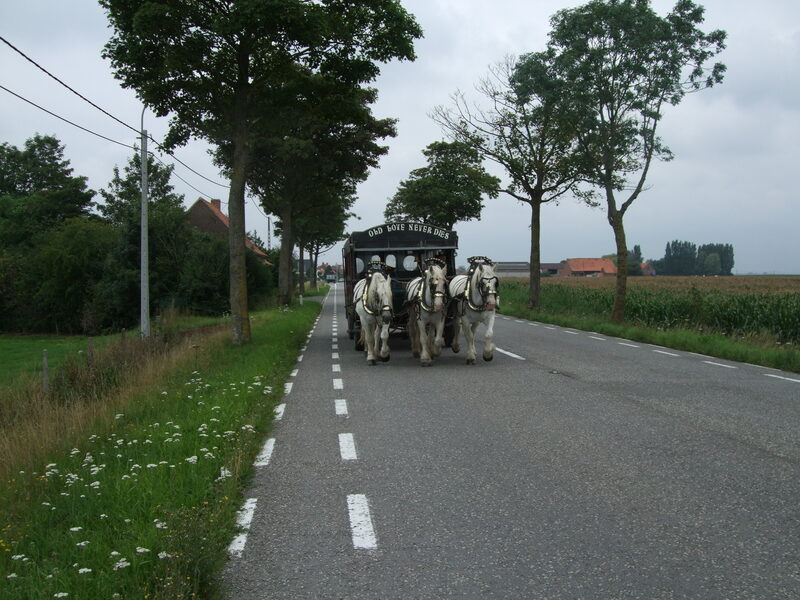 On the 19th of March,1918 , in pouring rain, Skinner was given a heroes funeral in which his body was brought by a gun carriage drawn by a magnificent team of horses to the Vlamertinghe Cemetery and was then carried by six VC holders of the 29th Division. I tried to imagine the scene on that day with the team of horses and the six VC holders. I left the cemetery and started to follow the road to Poperinge when I noticed something disconcerting heading towards me. A weird pattern was developing. I enter a village bar/café in the morning during my walk and basically the same scenario plays out. Four customers, usually men are sitting around the bar. Unlike a cafe or bar at home, they do not sit together but are spaced out, so the Flemish conversation forms a necklace round the bar. As I enter, the customers, together with the landlord/landlady stare at me like a scene in a cowboy movie where a stranger who has just rolled into the peaceful law-abiding town enters the saloon and there is a sudden silence. I always asked for coffee because for me, beer and walking don’t mix, especially in the morning. 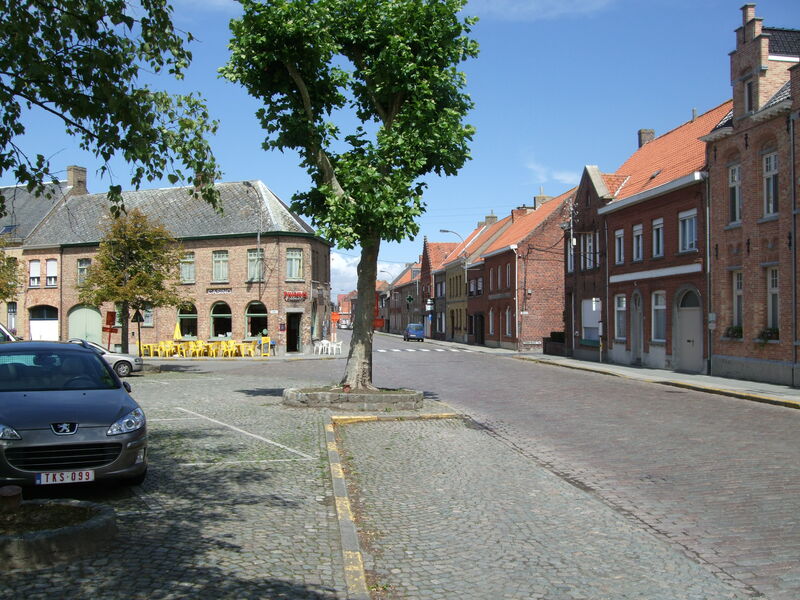 In the first of the Poperinge bars (four men and a landlady) into which the stranger had stepped out of the rain, the answer from the stern landlady was a definite no. At the second cafe,(three men and one woman and a landlady) I got the usual stare treatment ,though she eventually warmed to the wet figure in the corner of the bar, and I received a smile and a coffee with two cinnamon biscuits. That’s another thing about cup of coffee in Belgium. Even if you have wandered into some really grotty area you are still going to be given a biscuit with your coffee. In one cafe I was given a piece of cake and a biscuit though my favourite(in Passendaele village), was where a tiny bowl of what I took to be cream was placed beside my coffee. On further examination I realised that it was far too viscous and yellow to be cream for my coffee Making sure that no one was looking, to avoid looking stupid,I dipped my teaspoon into the delicate little dish. The taste was fantastic – a tiny bowl of what I would call creme Anglais -a beautiful cold vanilla custard. Early one morning I was walking up the Broodenside ridge, a much fought over village which during the war had been reduced to virtually nothing but mud,when I spotted an open cafe bar. I had been looking out for a chateau which housed a museum that I hoped to visit on my way back. In I go -yep four men and a middle aged landlady. However the stare factor lasts only thirty seconds and the coffee and bicuits are on their way. I ask the landlady about the location of the museum nearby and whether she thought it would be open since it was a Belgian public holiday. Unknown to me the four men were listening in. One of the men brought over a museum brochure and the other had already used his mobile phone to confirm that yes, the chateau was open all day. Langemark broke the numbers trend. It was nearly lunchtime. I had finnished my walk and walking through the village spied a board offering snacks. Eating out in Ieper was very expensive so I thought I would pop in and have a cheap lunch of macaroni cheese. Once inside, my audience consisted of only a young man,his wife and a landlord. He looked in astonishment when I asked for macaroni.”We only serve food at weekends”. Completely non plussed by the fact that he had gone to the trouble of putting out a chalkboard on the pavement, I forgot myself and ordered a beer!